With the windscreen positioned on the GTS, all the glass preparation can take place, including the application of polyurethane, the adhesive that bonds the windscreen to the vehicle. The Glass Table System allows the windscreen to be rotated into an upright position without the Technician having to lift it into this position and allows the Technician to walk through the front gap. 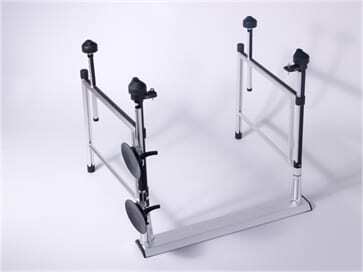 This method allows the Technician to remain in an upright position and is therefore more ideal compared to lifting off traditional trestle tables where the trunk is bent forward and the hands are outstretched away from the body during the lift.